In Liz Rosenberg’s We Wanted You, a family reflects on their experience of waiting and preparing for a child whom they have since adopted. The story shares how the adoptive parents wanted and waited to adopt a child. They were excited to have the child added to their family, and still are. They acknowledge that they are not the “first father and mother” of the child, and they express that in spite of this, they are “really” parents to the child because of all they have done. This book is worth a look; the cover artwork suggests that the family has adopted cross-culturally, which maybe adds emphasis to the statement that they are “really” parents. I can see this book being helpful in situations where a child feels like he or she doesn’t fit into a family because of different appearances. This could be a helpful resource for cross-cultural adoptive families with young children. A Mother for Choco and You’re Not My Real Mother both serve similar purposes. 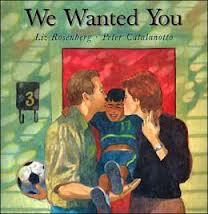 We Wanted You does not do much to address the child’s first family; it seems to simply acknowledge their existence. You can make this book a better tool by adding a page or two about your child's first family.